1. Mehmaid Throw Pillow $27.00/£17.93 [x] : I always find absolutely anything from Gemma Correll hilarious, and her Mehmaid illustration is no exception. Love, Love, LOVE. 2. Jammy Heart Biscuit Cushion £32.00 [x] : Don't ask me why I love biscuit cushions, I just do and it's not the first time I've featured one in this series either. If you love Jammy Dodgers (do they only have them in the UK?!) then you'll love this. 3. Woouf! Kitchen Cop Tea Towel £9.00 [x] : If you ever watched The Simpsons as a kid, then this will make you feel a little nostalgic. I always think tea towels should be a bit fun, so I'd love this in my house! 4. Hoorah! Confetti Crackers £16.00 [x] : Is it bad I'm already looking at crackers? In my defence, you can use these for non-Christmas celebrations! This pack of six, has crackers that each contain lots of confetti, a joke, paper hat and even a temporary tattoo! Definitely on the pricey side though, but hey a girl can dream! 5. Leather Passport Cover Powder Blue £15.00 [x] : If you don't have a British passport, then chances are you won't appreciate how cute this passport cover is. I just love the play on the usual design, with a cute lion and unicorn clutching a digestive biscuit. It's pretty quirky, but I love it! 6. Very Busy Sticky Notes £12.50 [x] : From this point onwards, my life is going to get really busy (the Christmas holidays will actually be a lifesaver) - so maybe I can justify investing in these adorable sticky notes? Maybe... They're actually imported from the American company Ban.do who I featured in my Blogger themed Weekly Homeware/Gifts Picks just in case you thought they seemed familiar! Thank you for reading lovelies! Let me know what you like most from this week's picks! OMG! 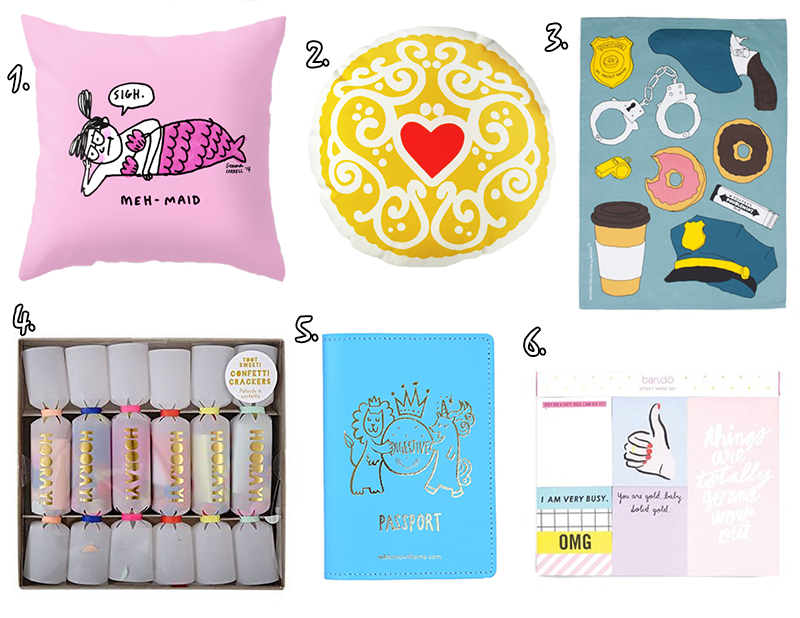 That mermaid pillow and the sticky notes are amazing. Love it. I went to Kinukinya this weekend, which in NYC is like this massive Japanese book/paper market and they had sooo many cute paper notes and pens but the prices were crazy! Like $15 for sticky notes. But I'm a sucker for cute little notes like that. Aww that sounds amazing! Japanese stationery is some of the best in the world, it's just SO cute! The leather passport cover is super cute and I love that it's in such a gorgeous blue shade too. And yes, the quirky design is definitely a winner! The shade is so gorgeous I agree. It's actually one of my favourite things I've found from this whole series! I love the passport cover, I've been meaning to get a new one and this one is really cute! Yeah, if I get one myself this is definitely going to be my first choice! The sticky notes are awesome! Great picks!! Thanks for sharing!! Thanks for the comment Trang!